﻿ Hotel TripAdvisor TripConnect We are proud to be a TripAdvisor TripConnect Premium Partner. We provide a simple API level connection that allows our hotel partners to manage their rooms, rates, and meta content automatically on this network.!. 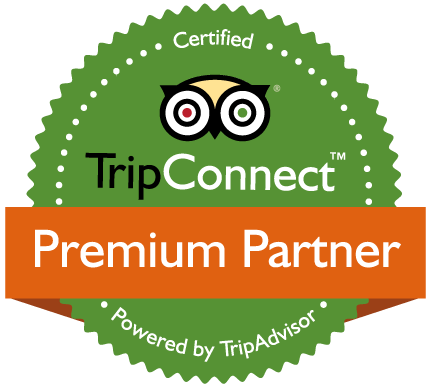 We are proud to be a TripAdvisor TripConnect Premium Partner. We provide a simple API level connection that allows our hotel partners to manage their rooms, rates, and meta content automatically on this network. Before connecting your hotel, you must be a participating member of TripAdvisor’s TripConnect program and have a valid Partner Id assigned by them. If you’re not already a member, you can sign up here. It takes about a week to have your application reviewed. In the next screen, select the rooms and rates to make available to TripAdvisor. Just click ‘Publish’ for each room and rate you want to make available. Usually you want to publish all your rooms and a selection of rates. 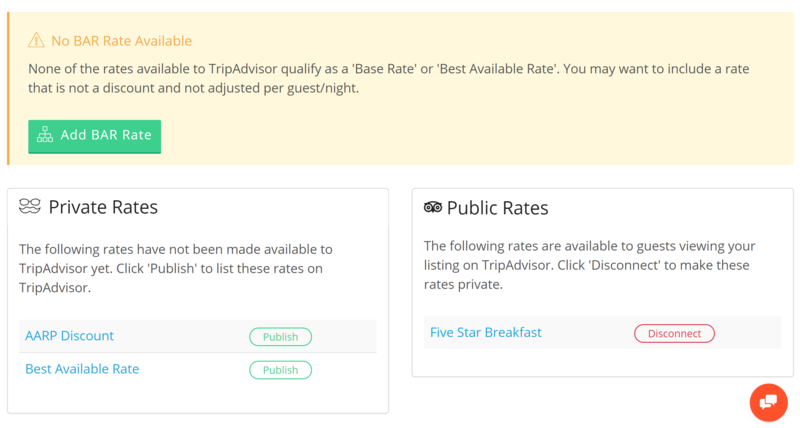 You can create rates to be used only on TripAdvisor, or other networks, but not available through your booking engine. For more info on local rates, select any of your rates, then click ‘Edit’ and see if the box for ‘Local Rate’ is checked. For TripAdvisor, make sure your hotel has at least one rate that qualifies as a ‘Standard’ or ‘Best Available’ rate. This is a non-discounted rate that is not priced per guest. For example, your ‘Best Available’ rate for TripAdvisor could be a rate that includes an adjustment of an additional 10% per room, and is not available locally. 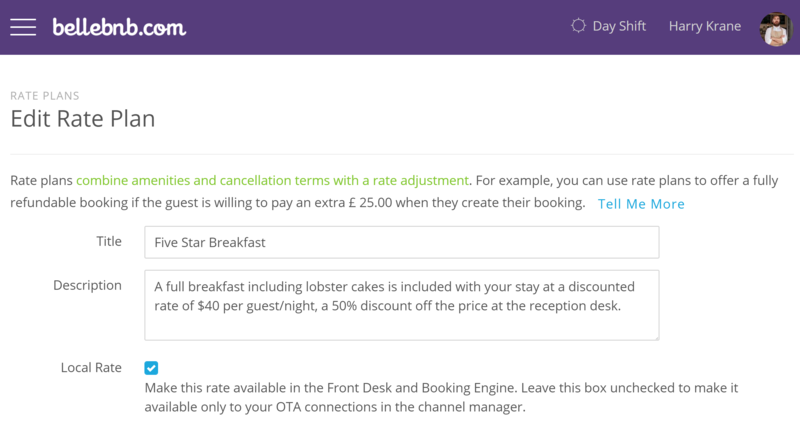 Just like with your other OTA’s, you can publish room prices per day. Click the ‘Room Pricing’ tab, select a room, and you have the familiar room pricing calendar. 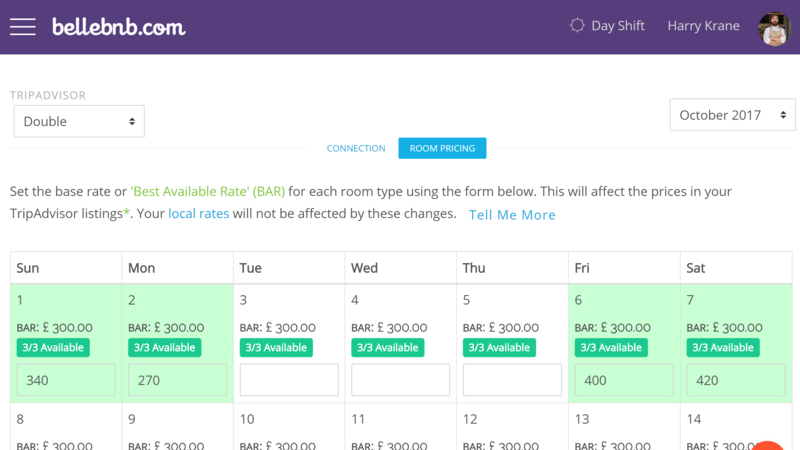 Use this interface to publish your base price per room type per day. The pricing pipeline for TripAdvisor is similar to your booking engine. The rate adjustment (for each rate available to TripAdvisor) is applied to the base price for the room type, and then your taxes and fees are applied. Both rates and taxes/fees take into account the number of guests for each room in the reservation, and the base price is taken first from your TripAdvisor pricing calendar, or your regular pricing calendar if no adjustment has been made for this network. TripAdvisor connectivity is available with either the monthly or yearly subscription plans. You must have your booking engine enabled to be able to use TripConnect because reservations are sometimes forwarded directly to your booking engine by TripAdvisor. 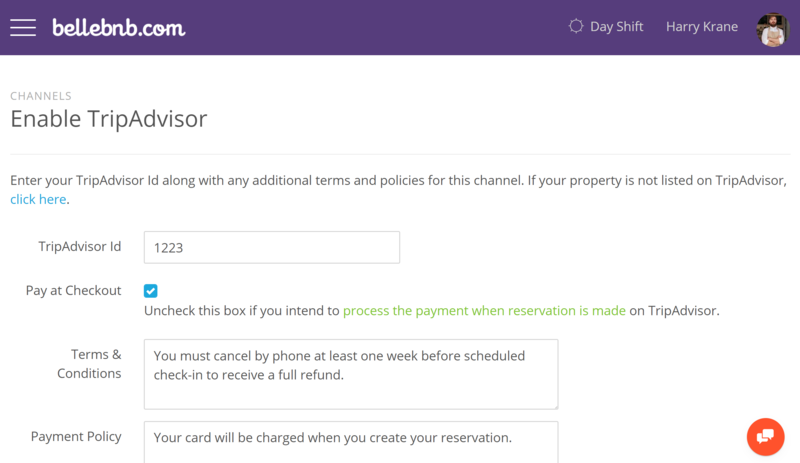 There is no additional fee or commission for selling your rooms on TripAdvisor through our API connection. Any fees for use of the TripConnect partner program are billed directly by TripAdvisor.